The cameras were rolling as the two ministers approached each other — but the interpreter was nowhere in sight. Yet thanks to the timely intervention and linguistic skills of Mr Victor Hui, the meeting between the Singaporean and Japanese officials went without a hitch. Smoothing the diplomatic path is part and parcel of his job. 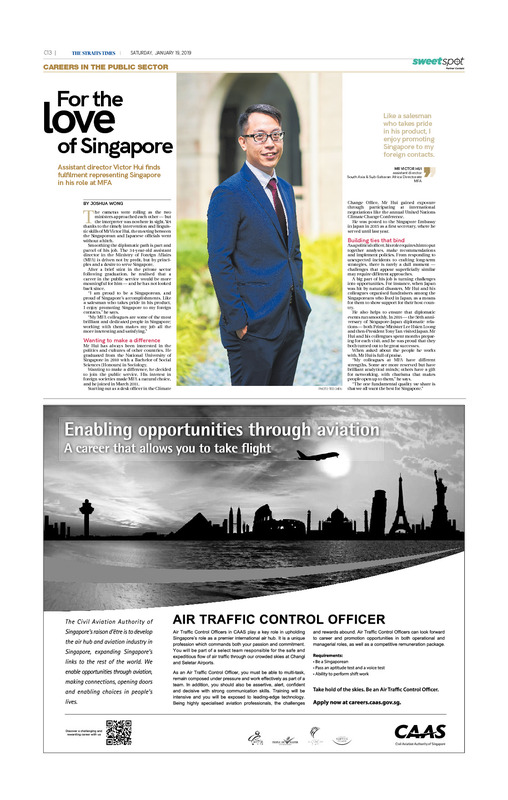 The 34-year-old assistant director in the Ministry of Foreign Affairs (MFA) is driven not by profit, but by principles and a desire to serve Singapore. After a brief stint in the private sector following graduation, he realised that a career in the public service would be more meaningful for him — and he has not looked back since. “I am proud to be a Singaporean, and proud of Singapore’s accomplishments. Like a salesman who takes pride in his product, I enjoy promoting Singapore to my foreign contacts,” he says. Mr Hui has always been interested in the politics and cultures of other countries. He graduated from the National University of Singapore in 2010 with a Bachelor of Social Sciences (Honours) in Sociology. Wanting to make a difference, he decided to join the public service. His interest in foreign societies made MFA a natural choice, and he joined in March 2011. Starting out as a desk officer in the Climate Change Office, Mr Hui gained exposure through participating at international negotiations like the annual United Nations Climate Change Conference. He was posted to the Singapore Embassy in Japan in 2015 as a first secretary, where he served until last year. As a political officer, his role requires him to put together analyses, make recommendations and implement policies. From responding to unexpected incidents to crafting long-term strategies, there is rarely a dull moment — challenges that appear superficially similar may require different approaches. A big part of his job is turning challenges into opportunities. For instance, when Japan was hit by natural disasters, Mr Hui and his colleagues organised fundraisers among the Singaporeans who lived in Japan, as a means for them to show support for their host country. He also helps to ensure that diplomatic events run smoothly. In 2016 — the 50th anniversary of Singapore-Japan diplomatic relations — both Prime Minister Lee Hsien Loong and then-President Tony Tan visited Japan. Mr Hui and his collengues spent months preparing for each visit, and he was proud that they both turned out to be great successes. When asked about the people he works with, Mr Hui is full of praise. “My colleagues at MFA have different strengths. Some are more reserved but have brilliant analytical minds; others have a gift for networking, with charisma that makes people open up to them,” he says.